Wall and entertainment units provide the organizational flexibility homeowners need to keep the clutter of various home entertainment devices from slowly taking over the living space. In addition, they allow space for display of family heirlooms and treasured mementos, as well as that collection of classic novels and art books. They give a room context and focus and make entertaining on any scale an easy, practical affair. There are a lot of other good reasons to have a first class entertainment center from Superior Closets installed in your home and here are just a few. Unlike an entertainment center bought at a furniture store, a custom designed entertainment unit from Superior Closets is designed with your home, your tastes and your things in mind. If you’d like to put more emphasis on books and photos we can do that. Want to create your own home theater? We can do that too. You decide. We design. If you’ve put a lot of time and energy into the interior design of your home, you don’t just want to buy a premade entertainment center and impose it on your hard-won harmony. We can design and build for you an entertainment center that meshes seamlessly with the rest of your interior design motifs. Special features are a big part of any custom designed and built wall and entertainment units. We can make your TV appear and disappear at the click of a button, you can adjust the lighting in different parts of the unit to emphasize different things at different times or to set different moods. Your speakers can be set on rotating platforms that will send the sound where you want it. In short, the sky’s the limit. 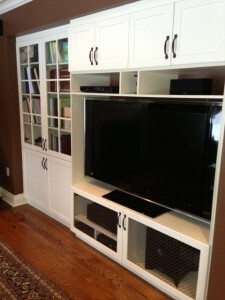 Custom wall and entertainment units from Superior Closets can be high-tech or low tech, discreet or highly visible. But whatever the style, materials and dimensions you choose, your Superior Closets entertainment unit is guaranteed to be of the highest quality and will serve you well for as long as you own your home. Your home is your largest single investment. Treat it as such. Invest in elements that enhance its aesthetic and bottom line value today and for years to come. Call us on 905-669-8280 to find out how a wall entertainment unit can be the finishing touch your interior design has been waiting for.